February is Heart Month, a month dedicated to raising awareness about the dangers of heart disease and promoting a healthy heart. February is an important month, but it’s also a fun month, Valentine’s Day is just a couple days a way and our office has been taken over by paper hearts, doilies and glue. One of the highlights of the month for us is spending an afternoon or two making Valentine’s with seniors in our community. We call it our “Valentine’s Day Crafternoon” and it’s fun! As the tables at the care facility or community center fill with paper and stickers, and card after card are glued together with love and laughter the stories begin. Most seniors didn’t stop at one or even two cards, but made card after card to send to family, friends and care staff. The whole afternoon is a reminder of the reason we love what we do: serving seniors in the home care industry. At Preferred Care at Home we are committed to safeguarding the dignity and independence of the seniors we care for. We do this by sending reliable and compassionate caregivers to a senior’s home or care facility to provide the care that is needed. The key component to providing quality senior care service is doing so in a way that safeguards both his or her dignity and independence. One way we look to help seniors maintain that dignity and independence is fostering an atmosphere of fun. Our Valentine’s Day Crafternoon is the perfect event for seniors to enjoy a fun activity, share stories, and socialize with others. The caregivers who provide senior home care understand the importance of supporting the dignity and independence of our senior clients. They go above and beyond in looking for ways to foster fun and playfulness, even in bed-bound senior clients. February is Heart Month, and for us, that means promoting a healthy heart and soul. Heart Disease is the leading cause of death in the United States, and we want to join in the effort to raise awareness and educated on ways to reduce the risk of Heart Disease. Last week, we discussed five ways you can make lifestyle choices to promote heart health, but you can also have fun! 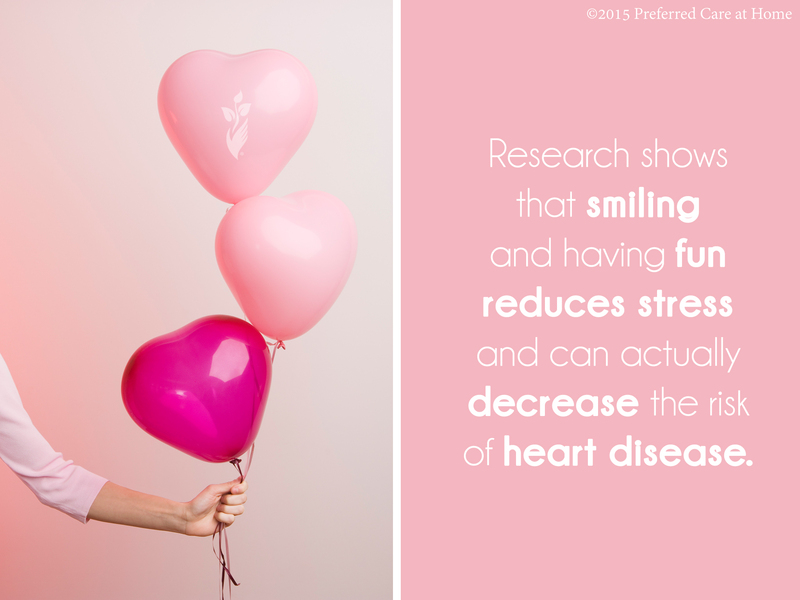 Research shows that smiling and having fun reduces stress and can actually decrease the risk of heart disease. So, there’s no excuse, do something fun this week!